Well, I don’t know about you, but I’ve certainly had quite a busy weekend! 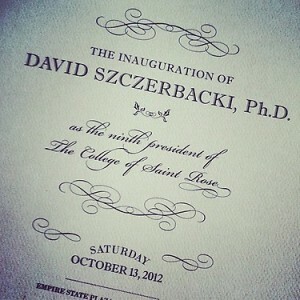 And it mainly centers around the inauguration of our new president, David Szczerbacki! 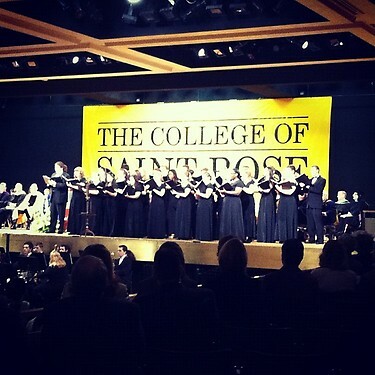 I was lucky enough to be able to attend the inauguration with the College of Saint Rose‘s Chamber Choir. It was so great to be a part of our College’s history! I felt so honored and blessed to have been able to witness such a momentous occasion. The ceremony started out with a lovely prelude concert by the Wind Ensemble, led by Dr. Robert Hansbrough. After that, a procession of all of the important people in the college community commenced. This included members of the Board of Trustees, representatives from the School of Arts and Humanities, The Thelma P. Lally School of Education, The Huether School of Business, and the School of Mathematics and Sciences. There were also representatives from the Student Association, Alumni Representatives, and professors who represented academic leadership. The ceremony began and was led by Daniel P. Nolan, the chair of the Board of Trustees (YES, the one the Nolan gym was named after). Salutations from various prestigious people followed, including Danielle Serrano (The SA President), Tony Mark Ledbetter, Michael A. Mogavero, and from President Szczerbacki’s daughter, Katherine Szczerbacki. During these salutations, there was a musical interlude, led by the Chamber Choir (featuring a solo by yours truly and Michael Hickey! ), singing “So I’ll Sing With My Voice” by David Argento. After the salutations and formalities, the moment we were all anticipating finally arrived – Dr. David Szczerbacki was presented with the Presidential Medallion. He then gave an amazing speech, discussing the past, present, and future of the college. He talked about his responsibility to the students and how he wants to put us first, his responsibility to the alumni to make them proud of the college, and his responsibility to make a case for higher education with its commitment to liberal arts and humanities. His mission is simple: to affect positive change in a global society. 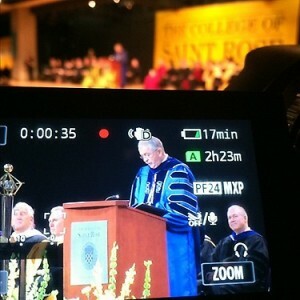 He praised the Saint Rose faculty and stated that faculty represent our core and are key to expanding next level of academic excellence. The ceremony closed with the Chamber Singers performing the “Saint Rose Song”, a benediction from the Bishop, and the recessional. It was a great time had by all who attended, and I feel truly honored to have been a part of this great ceremony. The celebration doesn’t end on campus, though! Tonight (Saturday night) the Saint Rose Orchestra will be performing a concert in honor of President Szczerbacki, featuring a performance of “A Lincoln Portrait” by Aaron Copland. It features actor Eddie Allen, a well known actor in the community who was featured in the hit sitcom “Seinfeld.” For next week, there will be a series of Community Service events in honor of the newly appointed president. And, of course, the students are still thrilled about the newset member of the Saint Rose Family! I know I am! For more coverage on the inauguration, visit the Saint Rose website! Leave comments below about how you feel about the new President!